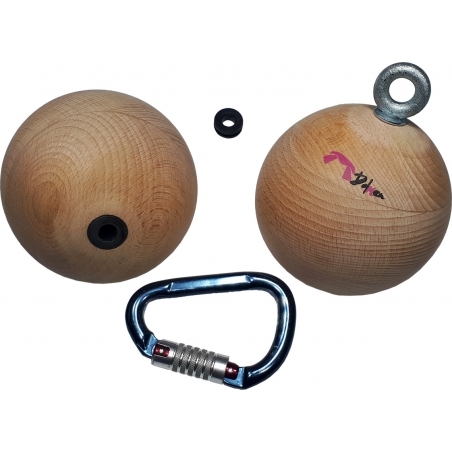 Holds 2 Wooden Balls 12cm Dolmen, ideal for big hands, are the perfect element to do pull ups and get the most out of your training and gain maximum strength. Being totally spherical, you can work perfectly the strength of your hands thanks to its perfect ergonomics. They come with a safety cap on the bottom to avoid sticking your fingers. 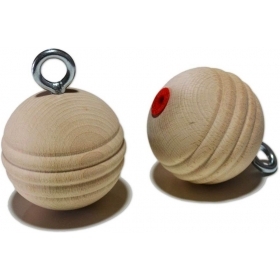 Holds 2 Wooden Balls 12cm Dolmen have a very elaborate design, a nice touch and are made of Beech wood (hardwood, shatterproof, free of defects and extremely resistant). A great feature that have wood as opposed to resin, is the roughness. 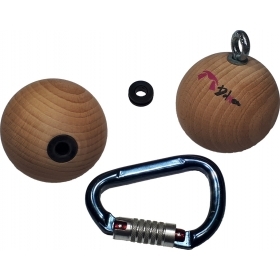 The grip of the resin helps you to catch, but with the wooden ones you do all the strength. 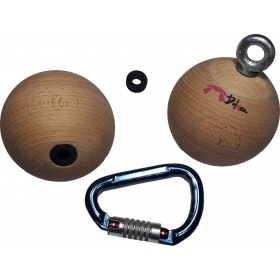 Holds 2 Wooden Balls 12cm Dolmen can also be hung on the boulder to practice roofs exits and/or tilt changes with imbalance, which will increase the control of the famous "hinges or doors". Weight: 600gr x 2 approx. espectaculares, sober guapas y grandes. duras de coger y con el sistema ese de que se suelten un poco y giren, son bomba!! !